Many couples are now choosing to forego tradition and shop for diamond engagement rings together. Many men admit they’re secretly glad they can shop together and get some help determining which ring style is right for their bride. However, if you want your proposal to be a complete surprise, read on. We’ll go over some of the latest trends in diamond rings to help you choose an engagement ring you’ll both love looking at again and again. Diamond rings come in a variety of styles, meaning there’s something to fit everyone’s personal style and taste. Luckily for shoppers, Brilliance.com has some of the most popular styles of diamond rings, including comfort fit solitaires, three diamond rings, halos, and vintage style diamond engagement rings. The comfort fit solitaire diamond engagement ring is one of Brilliance.com’s most popular styles. These diamond rings have a single diamond set on a wide or thin band. The stone can be cut into a variety of shapes, but the most popular are the round brilliant and princess cut. Other popular choices include the heart, asscher, pear, cushion, oval, radiant, or marquise cut diamond rings. Diamond rings with three stones have gained popularity in the past few years. The three stones are said to represent a relationship’s past, present, and future and are an ideal visual reminder of your love and devotion. These diamond engagement rings can have stones that are all the same size and shape or a large center stone with smaller outer stones. Some styles have stones all cut into the same shape or a princess or round cut center stone and triangle or baguette shaped outside stones. Halo diamond engagement rings have gained popularity in recent years. These diamond rings have one large center stone surrounded by a set of smaller diamonds. The center stone in these diamond rings can be round, oval, heart shaped, marquise, princess, cushion, pear, or asscher cut. The outer stones can be set in a bevel or prong setting. Vintage or antique diamond rings are ones that have been worn by someone else. They can be purchased from estate sales, antique jewelry shops, from an antique dealer, or can even be passed down through families. Because some couples are uncomfortable with the thought of using a previously worn ring as an engagement ring, it’s possible to find an antique looking ring that’s actually brand new. At Brilliance.com, one of the most popular metals for diamond engagement rings is platinum. Platinum is an extremely durable metal and is a good choice for diamond rings because it is tarnish resistant. Platinum is a rarer metal though, which can make it a more expensive choice. More people are turning to engagement rings made out of palladium and 18K white or yellow gold. Palladium is a relatively new metal on the jewelry market and looks a lot like platinum. The difference is that palladium is typically cheaper and lighter than platinum. 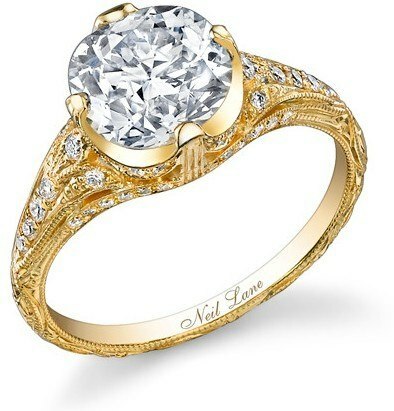 Brilliance.com has a large variety of both 18K white and yellow gold diamond rings for engagement rings. Both are good choices, but white gold can require a little more regular maintenance and upkeep than yellow gold. This is because white gold isn’t a naturally occurring substance and therefore shows wear a little quicker than yellow gold. White gold maintenance is easy to do and should not be a deterrent if you love the look of white gold. You’ll need to simply take your jewelry in for redipping every once in a while. Redipping restores the pure, white look of the metal and any reputable jewelry store should be able to perform this service. Some stores will need to send your jewelry out for service, while others may be able to do this while you wait. No matter where you take it, make sure to ask how long you’ll be without your ring so you can leave plenty of time to get it back before your wedding. If you’re having problems choosing from the large selection at Brilliance.com, consider asking one of our personal shoppers to help you with a custom designed diamond ring. The buyer can choose from a variety of center stones and settings. Doing this means you can choose the exact diamond you want for your ring. Brilliance.com has a variety of ready to fill settings and loose center stones to choose from. If you choose a loose stone with a ready to fill setting, you definitely want a certified stone. Certified stones have already gone through a strict grading process and will come with paperwork outlining the stone’s cut, color, clarity, and carat grade. The most common diamond grading certification comes from the Gemological Institute of America (GIA) but Brilliance.com also works with the American Gem Society, Hoge Raad voor Diamant, the European Gemological Laboratory, and the International Gemological Institute. Certified diamonds are also easier to insure because a trained gemologist has already graded it. This means that you likely won’t have to have it appraised before insuring your jewelry – it’s already been done for you. Diamond engagement rings are a symbol of your love that your bride will wear for the rest of her life and is often one of the first major purchases a couple makes. Before parting with your money, take a little time to research the different options and latest trends in jewelry design. No matter what you’re looking for, Brilliance.com’s personal shoppers can help you find something you’ll love.